Our team works day and night all year long to support the over 500 water and wastewater utilities in the State of Alabama. We have built a solid reputation of trust in the industry and provide a constant presence throughout the State. Being an Associate Member of the Alabama Rural Water Association will provide your group with access to events utilities are interested in participating in, as well as coverage of the State through many marketing opportunities. 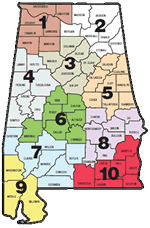 As the Primary Support Membership organization for water and wastewater groups in the State of Alabama, it is imperative that the Alabama Rural Water Association work to maintain a positive and constant presence throughout the State. By joining our Association as an Associate Member, your company will get to share in the benefit of all of that constant and hard work. Use our meticulously cultivated and mature network and platform in Alabama to instantly boost your company's reputation within this space simply by virtue of association. Averaging over 1,000 attendees and 140 exhibitors, this conference is one of the biggest of its kind in the Southeastern United States. A large number of utilities in the State are represented at this event. This is the premier event in Alabama to get your company noticed. We partner with our neighboring Rural Water Association in order to bring training to the Florida Panhandle and the Alabama Coast. We alternate years hosting this event in Alabama. Throughout the year, the ARWA hosts dozens of one-day training events offering Continuing Education Hours (CEHs) to water and wastewater professionals in Alabama. We regularly work with Associate Members to fill those agendas! The ARWA is constantly producing informational material in both print and digital spaces offering plenty of sponsorship and advertising opportunity for our Associate Members . The ARWA's partnerships with numerous State and Federal agencies such as (but not limited to) ADEM, USDA, DOE, ADECA, EPA, OWR, EMA, Homeland Security, DOL, and the Dept. of Agriculture offers a broad spectrum of exposure to any company with an Associate Membership with the ARWA. We at the Alabama Rural Water Association realize the value in being able to offer our members a great service at the lowest possible cost. Your partnership can help us maintain that goal while providing your group a platform for ultimate saturation and exposure in Alabama's Water and Wastewater Industry. If you are new to ARWA, we look forward to a long and prosperous partnership. If you are one of our many existing partners, we want to say THANK YOU!!! and we are happy to move into the future with your company's continued support of our Association. For additional information, read through our Associate Membership Brochure (pdf). The Alabama Rural Water Association has always offered our Associate Members a fantastic 'Basic' Membership with the Association that offers a solid entry level of exposure to the ARWA's member utilities. The ARWA has also always offered a variety of options in addition to the 'Basic' Membership that allow for our Associate Members to acquire additional levels of exposure and participation. We are pleased to now offer the opportunity to Bundle participation with the Association. A feature that has been frequently requested by our most active Associate Members, no longer will you have to go through the approval process for each event you wish to sponsor or participate with. Write one check and get everything you need! Download the entire ARWA Associate Membership Brochure (pdf) [3 MB].